I suppose you are angry. I will explain as soon as I am able to write a letter; have been sick. This is one of the pictures I took and promised you. will have to stay in town for a few months. will let you know when I return. there is no place like the Old Home. does it suit you. I wonder why Lucile believes W. E. Conner (recipient) might be angry. It is mysteries like this that make reading old postcard messages enjoyable. Lucile says she will explain as soon as she can write. Obviously she can write, or else someone else wrote the message. I like real photo postcards of Victorian homes for architectural reasons. The design of the window caps, corner trim, and color choices on this home make what could have been a plain home stand out. I noticed the front steps look to be carpeted. I wonder if this was normal. It is certainly the first time I have seen it. There is also the possibility this house didn’t have indoor plumbing in 1912 (notice outhouse to left under the trees). Postcards like this help in the restoration of Victorian homes. ** You can find more real photo postcards for sale in our store, Remember When Vintage Postcards. In this vintage postcard, a turkey is looking over a farm from afar; most likely thankful he isn’t on the menu. This year, I’m thankful I have a job that pays the bills and a roof over my family’s head. Let those of us who have, help those who have not in the coming year. Have a safe and happy Thanksgiving from Remember When Vintage Postcards. I have noticed an increased interest in blog posts relating to woman’s vintage fashions. The above fashion related real photo postcard was another find from the same collection as the postcard for the Camp Logan blog post. The lady is wearing a thick and heavy coat. The high buttoned collar looks snug, which should help in winter. The fur muff is bigger than others I have seen. I wonder if a bigger muff was unusual? ** You can find the above real photo postcards and others for sale in our store, Remember When Vintage Postcards. I just bought a collection of real photo postcards that has me going, “Wow”; talk about a piece of social history. In this collection were three real photo postcards of soldiers at Camp Logan. This World War 1 army training camp in Houston, TX gained notoriety in August 1917 for a race related riot, and again the following year for the first widespread local outbreak of the Spanish Flu. I kept thinking, while reading an article about Camp Logan on Wikipedia, why wasn’t this taught to us in American history class? Yes, it was one of the saddest chapters in the history of American race relations. If we are to learn from what happened during the Houston Riot of 1917 we need to be told about it. History was not meant be swept under the rug. This is why postcards are so important. As for the soldiers in the real photo postcard above… Hopefully they weren’t amongst the 48 soldiers from Camp Logan that died during the Spanish Flu outbreak of 1918. ** You can find the above real photo postcard and others for sale in our store, Remember When Vintage Postcards. It always amazes me to read what early 1900s buildings cost to build. 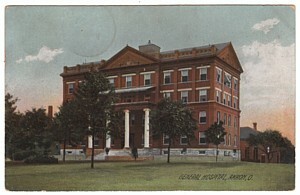 Akron’s “new” city hospital was dedicated in April 1904 at a cost $203,600.94. I suppose that was quite a huge sum of money back then to the residents of Akron, OH. The city’s wealthy gathered money to buy the first hospital, the Dr. SW Bartges Mansion on East Market St, in 1892. I could not find reference to the funding source for the “new” city hospital, but can probably assume a vast majority also came from Akron’s wealthy. I also found references during my research, to The Idabelle Firestone School of Nursing (dedicated in 1929). I couldn’t tell if the school was located in the new hospital. If it was, the new hospital also had a pool and gym (still used by hospital staff today). Wow, luxurious accommodations for a school. 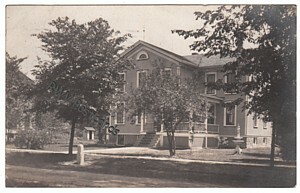 There is a more recent pic of the new hospital showing the addition to the front at http://www.akronhistory.org/hospitals.htm. I ran across a picture of the main operating room in the new hospital I found interesting. I’ll have to show it to my sister, an ER nurse, who at one time was an operating room nurse.